We receive many questions from our subscribers (keep them coming!). Here’s 2 chosen from the Boxing Masterclass Q & A board – both great questions, and I’m positive they will be of benefit to your training. You’re spot on to be looking into body shots – they’re great punches to throw and can be really effective to wear your opponent down. As with the age old boxing adage “Kill the body and the head will die”. It’s also great practise to target the upper and lower body, switching between the 2 will make your opponent more wary as they won’t be sure where you’re going to strike. Using body shots can also make your opponent start defending low which in turn can open them up for head punches. A great way to start using body hooks is to use them off a slip. 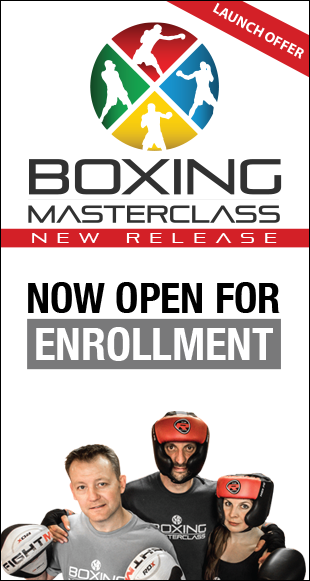 Start by jabbing and waiting for your opponent to jab back. As soon as they do slip to the side to avoid their jab and throw in the body hook. Another good way to get in close (especially against an opponent who likes to step in with a jab cross) is to sit down in your stance as they come towards you and fire off a left, right body hook. Make sure you bring you hands back to guard your head straight away. It’s definitely worth taking a look at some of Golovkin’s fights on YouTube. He uses body shots very effectively (even on knockouts) – He hooks up high, so the opponent thinks he’s going for a headshot and raise their guard – then follows through with shots to the body. Other boxers good at body shots you can study are Jake La Mota, Sugar Ray Robinson, Roberto Duran. Should the stance be narrow or more square on? Regarding the stance, yes, you want to be more square on than you described. Footwork is what makes great boxers stand out from good boxers and the winners stand out from the runners-up – so I’d like to share this with you guys. If you stand shoulder width apart, then literally step your right foot back in a straight line (if you’re orthodox) then twist your feet slightly and you should be in the right position. • It forms a strong base for you to defend and throw your punches. • You have a longer range with your power hand (than a narrower stance). • You’re more balanced if you have to absorb hooks. • It’s easier to move in any direction (due to being more balanced). 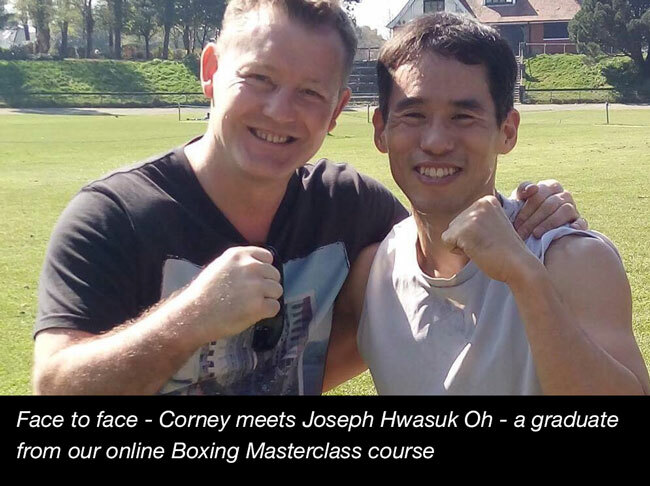 This spring Corney was visited by a Joseph Hwasuk Oh from South Korea – a graduate from our online Boxing Masterclass course! Joseph, who is a licenced international referee in IOC-recognized amateur kickboxing, was preparing for an intergym fight against an opponent 10 years younger from East Los Angeles. He went on to win the fight. Corney – “I was impressed with Joseph’s fitness when he arrived – we focussed on sprint work but were quickly able to progress onto the more technical aspects of boxing. He is very studious and keen to improve – and I feel made some real gains on the technical side, specifically in his footwork and combinations”.